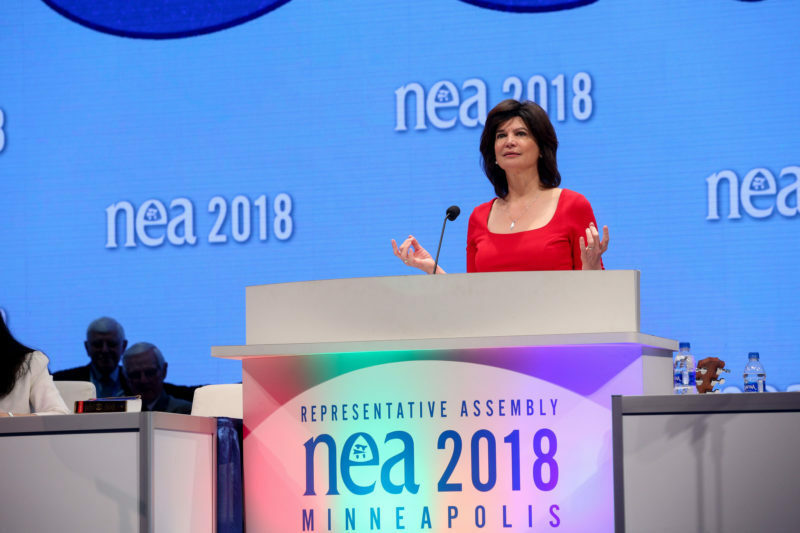 NEA President Lily Eskelsen Garcìa’s passionate opening remarks brought forth waves of cheers and tears at the NEA Representative Assembly, which continues throughout the week in Minneapolis. From the attacks on workers by billionaire special interests, to the national #RedForEd movement, to the activism shown by students to end gun violence, Eskelsen Garcìa’s remarks captured the unique moment we’re in – and closed with a call to keep perspective on what we’re fighting for. In an RA first, Eskelsen Garcìa yielded her time to recent Marjory Stoneman Douglas graduate David Hogg, who spoke to delegates about the survivors’ inspiring work to end gun violence in the wake of the Feb. 14 shooting at their school in Florida. Read more about the speeches – or watch them on Facebook Live (Part I and Part II). You can stay up to date on the happenings at the RA – where more than 230 Michigan Education Association members are serving as delegates to the top decision making body of the NEA – at www.nea.org/ra.